FILE - A general view shows the town of Azaz, near the Syrian-Turkish border, March 11, 2014. The multi-sided war raging in Syria became even more tangled when Turkish troops shelled positions near the border controlled by U.S.-allied fighters from the Kurdish People’s Protection Units, or YPG. Turkish Prime Minister Ahmet Davutoglu confirmed the overnight Saturday artillery barrage and demanded the YPG withdraw from the Syrian border town of Azaz and vacate a nearby air base the Kurds seized last week from Syrian rebel forces. The Turkish shelling continued Sunday. The Kurdish rebels backed by the West and Gulf countries have been battling for more than a week against a ferocious Russian-backed offensive by Syrian President Bashar al-Assad’s forces. Operations by YPG forces and their allies in northern Syria the past few days have complicated the defenses of the Western-backed Free Syrian Army (FSA) and Islamist militias. Syrian rebels accuse the YPG of coordinating with the Assad government and acting as a spoiler tactically. 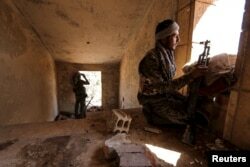 FILE - Kurdish People's Protection Units (YPG) fighters take up positions inside a damaged building in al-Vilat al-Homor neighborhood in Hasaka city, Syria. Rebel commanders say YPG fighters are now in parts of Azaz just six kilometers from the border with Turkey. The YPG is in effect the armed wing of the Democratic Union Party (PYD), which in turn is an offshoot of Turkey’s outlawed Kurdistan Worker’s Party (PKK). Turkey considers both the PYD and PKK as terrorist groups. Despite continued Turkish shelling Sunday the YPG claimed to have captured the village of Ayn Daqnah, east of Menagh and south of Azaz. Rebel commanders accuse the YPG, which has been the most effective partner with the U.S. on the ground in the struggle against Islamic State in Syria, of assisting a government assault on the nearby and strategically important town of Tell Rifaat, where on Saturday women started to arm themselves to form a loosely coordinated battalion. According to Turkish military officials, the shelling of YPG positions came in retaliation for Kurdish gunfire and was focused just southwest of Azaz. Rami Abdel Rahman, of the Syrian Observatory for Human Rights, a monitoring group, said Turkish shelling struck wider afield, targeting YPG positions near the Menagh, an air base the Kurds took from Syrian rebels. FILE - A Free Syrian Army fighter cleans an anti-aircraft artillery gun near the Menagh military airport in Aleppo's countryside, Feb. 17, 2013. Turkish officials also confirmed that on Saturday Turkish soldiers shelled Syrian regime forces near the Çalıboğazı border post in the province of Hatay. Again they say this was in retaliation for gunfire directed at them. The shelling came as both Turkish and Saudi officials upped their talk of dispatching a ground force into northern Syria ostensibly as part of the international coalition’s struggle against Islamic State militants. But in an interview Saturday with German newspaper Handelsblatt Saudi foreign minister Adel al-Jubeir focused his comments on Russia's military intervention, saying it would not help Assad remain in power, suggesting both Ankara and Riyadh may be contemplating military action against Assad, widening a war dangerously and raising the prospect of a Turkish clash with the Russians. “There will be no Bashar al-Assad in the future,” he told a German newspaper. FILE - Turkey's President Recep Tayyip Erdogan, right, greets Saudi Arabia's Foreign Minister Adel al-Jubeir before a meeting in Ankara, Oct. 15, 2015. Turkey’s Foreign Minister Melvin Çavuşoğlu seemingly took back on Sunday earlier remarks that suggested a strategy had already been agreed upon by Turkey and Saudi Arabia for a ground campaign, saying no solid decision for such an operation had yet been reached. But he did confirm Saudi Arabia would be sending an undisclosed number of warplanes to the NATO air base at Incirlik in Adana near the Syrian border in southern Turkey. “As of today, there is no decision regarding a ground operation,” he said. Turkish media are reporting that eight to10 Saudi jets will be deployed at Incirlik within the coming weeks. Four F-16 fighters are expected to arrive in a first wave. Turkish Prime Minister Davutoglu appeared to stress Turkey’s wish for a wider intervention than just one focused on Islamic State. “We will take every necessary step to ensure an environment that guarantees Turkey’s security, an environment without Daesh [IS], the Syrian regime or the PYD,” he told a news conference in Erzincan, northeast Turkey. Davutoglu expressed frustration with the ongoing UN-brokered peace negotiations in Munich, casting doubt on the hopes for a cessation of hostilities that is meant to begin in days. 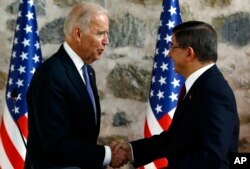 FILE - U.S. Vice President Joe Biden, left, shakes hands with Turkish Prime Minister Ahmet Davutoglu, right, following a joint news conference after their meeting in Dolmabahce Palace in Istanbul, Jan. 23, 2016. U.S. officials say there is little to be done to counter militarily the Russian-backed Assad offensive and they argue the vicious five-year-long Syrian civil war that has left upwards of 250,000 dead won’t be resolved by the clash of arms but through a negotiated political settlement.